We specialize in high quality, quick-turn x-ray duplication. We provide service for malpractice and personal injury cases throughout the entire United States. Attorneys and legal service offices specialized in personal injury litigation, medical malpractice and workers compensation cases can rely on our expertise in their case preparation, jury trials, depositions, mediations, and settlement disputes. 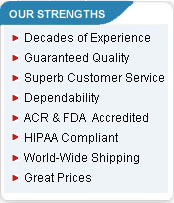 We are fast and dependable. 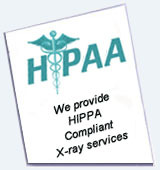 X-ray copying is our highest priority and we can respond to your request immediately. So rather than relying on the hospital or someone else for x-ray duplication or x-ray images, our clients send their x-ray films to us for quick and professional x-ray duplicating at a fraction of the cost. Furthermore, our experience with x-ray scanning and digital x-ray conversions, allows us great flexibility in providing you with custom work in support of any trial presentations. If you are in the midst of a legal proceeding and your attorney needs hard film x-ray duplication, x-ray pictures, or digitized x-rays, we will coordinate pick-up of the original, make a high quality x-ray copy (x-ray films or xray CDs) and deliver the finished product to your attorney's office to save valuable time. If you are an attorney, please contact us and one of our representatives will answer all your questions and, if needed, begin working with you right away. We provide X-Ray copies, to hospitals, nursing homes, physicians, various medical facilities, attorneys, legal services, private patients, insurance companies and any other interested parties. We ship anywhere in the world. US customers can choose overnight and 2-Day Air in addition to standard ground services. For international customers we will strive to provide in each case the most appropriate method of shipping to their specific destination.